When cold weather hits, a warm fire will do just the trick to keep you and your home nice and warm. Make sure you have a good fireplace tool set ready to stoke and tend that fire. Argyle Feed Store now have these toolsets by HomeBasix available in store. These tending tools are essential to keep your home fireplaces safe for you and your family. This sturdy tool set has a black finish and has two handle options. One is a decorative ball and the other is loop handles which also serve to hang the tools on the stand. 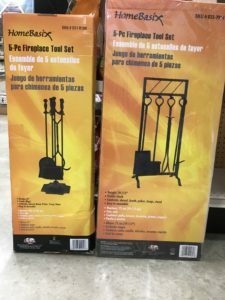 Stop by Argyle Feed Store and get your fireplace tool set today! This entry was posted on Wednesday, December 20th, 2017 at 9:31 pm	and is filed under News & Updates. You can follow any responses to this entry through the RSS 2.0 feed. Both comments and pings are currently closed.